به منظور بررسی تأثیر کودهای آلی، شیمیایی و بیولوژیکی و آبیاری تابستانه بر خصوصیات رشد، بنه، گل و کلاله زعفران، آزمایشی به صورت فاکتوریل در قالب طرح پایه بلوک‌های کامل تصادفی با سه تکرار در مزرعه تحقیقاتی دانشکده کشاورزی دانشگاه فردوسی مشهد طیسه سال زراعی 93-1392، 94-1393 و 95-1394 انجام شد. فاکتور اولشامل کود دامی (a1)، کود شیمیایی (NPK) (a2)، تیوباسیلوس (a3)، گوگرد (a4)، a4+a3و شاهد (a5) و فاکتور دوم، آبیاریتابستانه در سه سطح شامل عرف منطقه (A: بدون آبیاری تابستانه)،A+ یک نوبت آبیاری تابستانه (اول مرداد) و A+ دو نوبت آبیاری تابستانه (اول تیر+اول مرداد) بود.صفات مورد مطالعه شامل تعداد و وزن تر گل، وزن خشک کلاله، وزن خشک برگ،قطر بنه، وزن بنه در چهار گروه وزنی (4-2، 8-1/4، 16-1/8و بیش از 1/16 گرم)، وزن خشک بنه‌های دختری، درصد بنه‌های دارای ریشه انقباضی، تعداد و وزن خشک جوانه‌های گل دهنده بود. تجزیه و تحلیل نتایج سال سوم نشان داد کهاثر متقابل کود و آبیاری تابستانه، بر تمام صفات مورد بررسی به جز وزن خشک کلاله، بنه‌های با وزن بیش از 16 گرم و وزن خشک بنه‌های دختری معنی‌دار بود (01/0p≤). بیشترین تعداد گل در متر مربع (7/282)، وزن تر گل (g/m22/103) و وزن خشک کلاله (g/m273/1)، وزن خشک برگ (g/m233/13)، وزن خشک جوانه‌ها (g/m261/4)، تعداد جوانه‌های گل دهنده در بنه (627/2)، درصد بنه‌های دارای ریشه انقباضی (41/58)، قطر بنه ( cm61/3) و گروه‌های مختلف وزنی بنه در تیمار کود دامی و A+یک نوبت آبیاری تابستانه مشاهده شد. 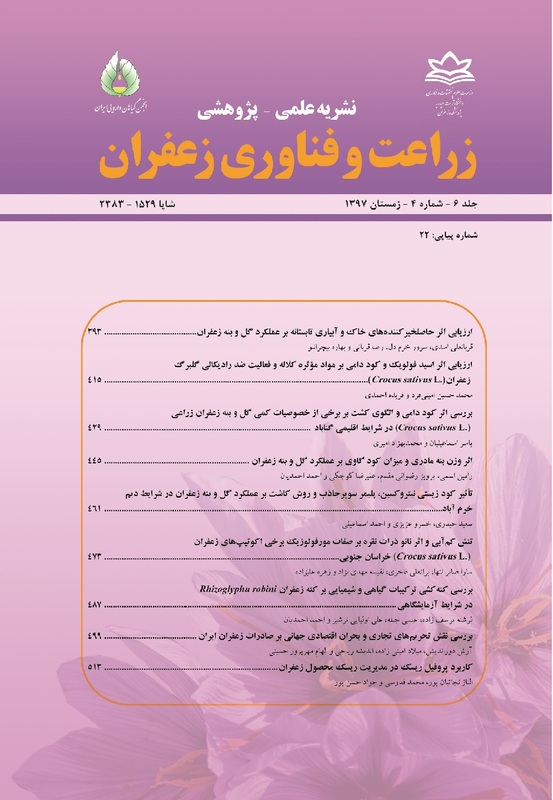 In order to evaluate the effects of organic, chemical and biological fertilizers and summer irrigation on growth characteristics, corm yield, flower yield and stigma yield of saffron, field experiment was conducted as factorial based on a randomized complete block design with three replications at Agricultural Research station, Faculty of Agriculture, Ferdowsi University of Mashhad during three growing season of 2013-2014, 2014-2015 and 2015-2016. The first factor included of animal cow manure (a1), chemical fertilizer (such as Nitrogen, P and K) (a2), Thiobacillus (a3), sulfur (a4), a3+a4 and control (a5) and the second factor was summer irrigation in three levels such as conventional irrigation (A: without summer irrigation), A+ once summer irrigation (23 July), A+ twice summer irrigation (22 June+23 July). Studied characteristics were number and fresh weight of flower, dry weight of stigma, corm diameter, corm weight in four groups (16 g), corms with contractile roots, number of flowering buds per corm, leaf length, dry weight of leaf and dry weight of tunic of saffron. The results in the third of experiment revealed that the interaction effect between fertilizers and summer irrigation were significant (P≤0.01) on all studied traits of saffron except stigma dry weight, corms with weight more than 16 g and dry weight of daughter corms. The highest flower number (282.7 per m2), flower fresh weight (103.2 g/m2), stigma dry weight (1.73 g/m2), leaf dry weight (13.33 g/m2), buds dry weight (4.61 g/m2), flowering buds number per corm (2.627), corm percentage with cractile roots (58.41%), corm diameter (2.97 cm) and corms in different weight were obtained in animal manure and A+once summer irrigation. About simple effects, the highest stigma dry weight and dry weight of daughter corms were observed in animal manure and the highest amount of this traits were obtained in treatment A+once summer irrigation. It seems that summer irrigation increased the flower and stigma yield of saffron due to decreasing soil temperature.